New Delhi: Industrialisation supported by the emergence of various management practices has led to indiscriminate and exploitative extraction, abuse of natural resources and wider incidence of inequality on the name of economic growth and development. Today, our world is struggling to envision a sustainable future and demands for a far more holistic worldview and vision besides the idea of GDP as an indicator of development and growth. This would only be possible through a brand of leadership and management steeped in the idea of universal human values, collaboration based on the principle of win-win and not win-lose, systems and design thinking and ability to visualise the world and society we would like to leave for the future generations. Given the complexity and diversity of development issues in India, there could be no better place in the world to give birth to this pioneering and critical idea of Development Management and Leadership. Indian Social Sector leaders along with Indian School of Development Management (ISDM) announced February 1st as Development Management Day to bring to fore the importance of this idea and celebrate the amazing work done by development leaders and managers currently and over the years to come. The celebrations for Development Management Day, 2019 was graced by people who have done decades of outstanding work in the social sector along with young leaders who are now looking to visualise and build a just, equitable, humane and sustainable society in the years to come. The key note address at the event was delivered by Ramon Magsaysay Award Winners- Harish Hande (Co-Founder SELCO), Rajendra Singh (Founder, Tarun Bharat Sangh), and Anshu Gupta (Founder and Director, Goonj). Khushboo Awasthi (Co-Founder, Mantra for Change), Padmakshi Badoni (Azad Foundation), Shubhendu Sharma (Founder and Director, Afforestt), Wekoweu Tsuhah (Director Programmes, North East Network), Ravali Pidaparthi (Team Member Udhyam, Alumnus ISDM) and other eminent dignitaries also participated in the event. With 3.3 million Non-Profit Institutions (NPIs) employing over 18.2 million people, supported by contributions from funders, enabling organisations, the government, and businesses, the Indian development sector is one of the largest and most active social economies in the world. Development space is desperately looking out for people who understand the sector and are able to contribute in constituting world class, impactful, sustainable social organisations using mantras of leadership and management relevant to the development sector. 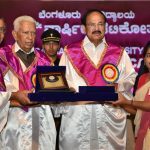 Development Management as a new discipline would require as its base high quality, world class institutions that can make a difference to the sector and society. These institutions will provide the much needed vibrant & active learning environment to the brightest minds passionate about social change. This makes it extremely important for India and the world to make Development Management mainstream and establish it as a meaningful profession. India is one of the best places to give shape and thought leadership for Development Management Discipline to the rest of the world, thus the most apt place for celebrating the first ever ‘Development Management Day’.